Banned books on the go, on a bracelet. Go here for more. New York: Harper Collins, 2010. It’s interesting, the word “classic.” A phrase I come across often when reading reviews of children’s books is “an instant classic,” as if sales alone could invest a book with the aura of story long and well-loved. A variety of adults, mostly eccentric in Scout’s judgment, and a continual bubble of incident make To Kill A Mockingbird pleasant, undemanding reading. Neither Harper Lee nor this reviewer knew what kind of an impact the book would have on America, and its impact was huge. The Pulitzer Prize, sales of more than 30 million, and year after year it tops lists of best/most loved/most influential books of all time. 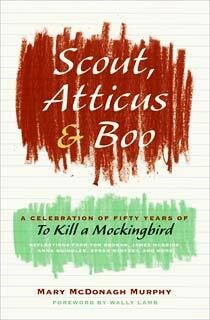 Scout, Atticus & Boo does not set out to anoint the best book of all time, it is about sharing love and admiration. Part One of the book is an essay by Mary McDonagh Murphy, whose documentary Hey, Boo is the source material for Part Two, the two dozen commentaries by friends of Harper Lee and famous admirers of her book. Part One is much, much more readable and enjoyable because it originated as a written piece. The author covers the political and biographical contexts of the book, its reach and influence, and the privacy and silence of Harper Lee in the wake of her book’s enormous success. Part Two is simply not a comfortable read because these are not essays, they are the transcripts of interviews for the film, and read as choppy and scattered. I would suggest seeing the interviewees come alive on film rather than reading the transcripts in this book. I re-read To Kill a Mockingbird this week because it was the book for my book club, and we had a delightful night of discussion. The week before Father’s Day was the perfect time to meet Atticus Finch again. He is so unruffled, so positively adoring of his children even without the demonstrative behaviour of today’s doting and high-fiving parents. Atticus Finch, in some ways, was the father maybe that I longed for. But when I became a father, I found it very difficult to be that kind of father. I have found it impossible not to tell my daughters how much I love them at every juncture. Atticus is reserved. He trusts his daughter. He trusts his daughter to understand what is essential about him and about herself and about their relationship. I could never have gone about it that way, and yet there was some part of me that knew as a father that less would have been more. I think Atticus knew that and was able to act upon it as principle. That great ability to trust a child and that great ability to understand that a child will know in the fullness of time what it is that you’re trying to get across. And that what you do, even more than what you say, will be all that that child ultimately will need. Roseanne Cash sums up his greatness for me when she says, “Atticus is a real grown-up.” It’s hard to be a grown up, and, like Russo, I admire Atticus’s reserve even if I cannot reproduce it. Atticus struggles with being a single parent, and we are to understand that his sister, Aunt Alexandra, with her ladies’ teas and her insistence that Scout wear dresses, is an unwelcome reminder of his unsuitability as a parent to a growing girl. She wants Scout to behave like a lady, and we know that’s just plain wrong. But, but, but who could fail to swell with pride when, at the end of their harrowing night, Scout demonstrates all of her father’s quiet courtesy and will not lead Boo Radley back home, but takes Mr. Arthur’s arm like a real lady? I led him to the front porch, where his uneasy steps halted. He was still holding my hand and he gave no sign of letting me go. He almost whispered it, in the voice of a child afraid of the dark. I put my foot on the top step and stopped. I would lead him through our house, but I would never lead him home. I slipped my hand into the crook of his arm. 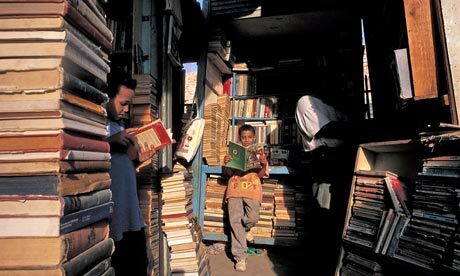 The Guardian has an article about a bookish outcome of the revolution in Egypt: the return of banned authors to the bookstalls. 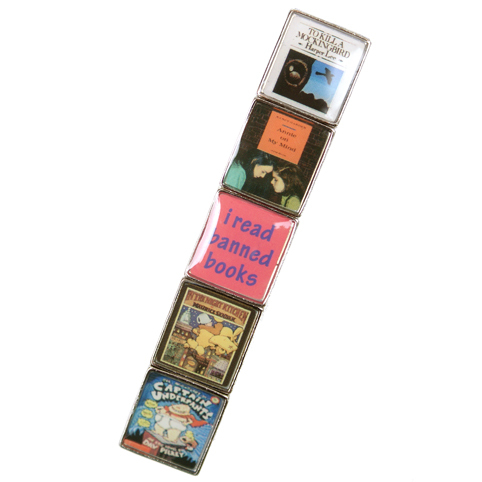 4 Mothers are talking about banned books over at my other blog this week.